These highly addictive quick-fire puzzles are perfect for solving back whenever you have a few seconds to spare. Using your logic skills place twelve bees adjacent to each of the twelve flowers. The rules are simple enough - the number at the start of each row and column indicates how many bees should be placed in that particular line. Each flower must have one bee attached to it and each bee must not be adjacent to another. 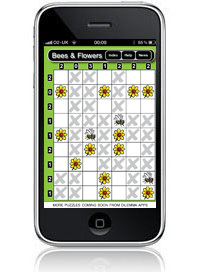 This App contains 12 FREE puzzles and additional packs of 100 can be purchased. We have created an iPad specific version that has a larger grid and is more challenging. Its now available on the App Store.